Debunking Christianity: Southern Baptists Continue Their Tradition of Bigotry. Southern Baptists Continue Their Tradition of Bigotry. The Southern Baptist Convention, under the leadership of Rev. Fred Luter Jr. just voted to officially condemn the policy of the Boy Scouts of America, which now allows the participation of gay Scouts. 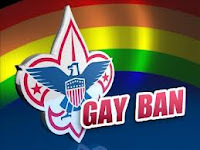 They will seek the removal of executive and board members of the Boy Scouts who tried to allow gay members without first consulting religious groups. They affirm support for churches which decide to drop ties with the Boy Scouts.. The irony in all of this? The Southern Baptist denomination formed as a pro-slavery breakaway from American Baptists, in 1845. In 2012, they tried to atone for their racist past by electing Fred Luter - a black man - as their leader. And now, under his leadership, they vote overwhelmingly to support bigotry against gays. Seriously, you can't make this stuff up!